Drizzt Do'Urden fans, take a breath. 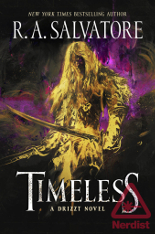 You've been waiting for the beloved dark elf from Dungeons & Dragons‘ Forgotten Realms to return, and we’re excited to exclusively announce R.A. Salvatore is continuing his story with Timeless (see the cover below). Salvatore told Nerdist, "I wasn’t really ready to say goodbye to Drizzt and the gang. Even after all these years, there seemed to be dozens and dozens of stories left to tell. These characters have become like my family." Salvatore created Drizzt 30 years ago, so it’s not surprising he feels so close to the character. "I'm super excited to be able to work with Wizards of the Coast, David Pomerico and the folks at Harper Voyager to continue to publish Drizzt stories set in the Forgotten Realms," he said. "I still enjoy writing these characters and I’m interested to see where they take me next." Harper Voyager executive editor David Pomerico shares Salvatore’s enthusiasm. "Growing up, a few characters sucked me into the world of science fiction and fantasy. Ender. Garion. Tasselhoff Burrfoot. And, of course, Drizzt. So when the opportunity came around to work with Bob on a character that not only meant so much to me, but is truly one of the iconic fantasy characters, I jumped at it," he shared.